The red imported fire ant is an invasive insect with the ability to sting repeatedly. The sting typically results in complaints of burning, itching and a white pustule that forms within 48 hours. Fire ants build mounds in the areas they inhabit, and will swarm when their mound is disturbed. They among the worst pests in the Southern United States in terms of effects on human health, property damage, and environmental damage. The Bug Dude can provide the professional pest control in Fort Worth, Texas you need for fire ant control. Fire ants form colonies close to homes, and prefer sunny locations such as dry fields and lawns. Entire colonies will occasionally nest in walls or rafters, and occasionally move in homes or other structures during floods or extended drought. Colonies can contain a population of several hundred thousand ants, and one or more queens. They are a threat to sleeping people, and especially to invalids and infants or small children. 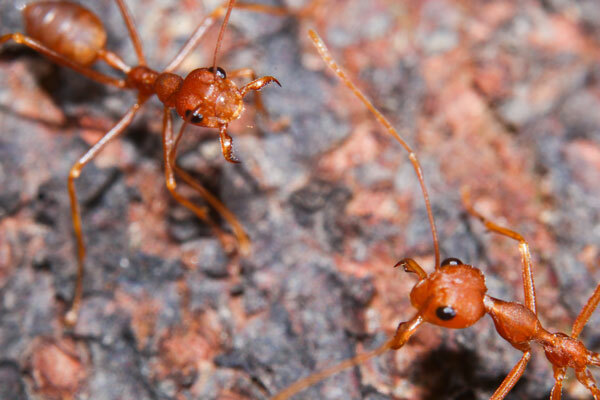 Serious injury or even death may occur when fire ants attack these defenseless victims. It is not uncommon for fire ant mounds to appear after rain. Furthermore, when they first appear in the spring is the time to administer the first treatment. Contact the Bug Dude today to receive professional pest control in Fort Worth, Texas of your lawn and home. Fire ants are known to cause property damage, including in home’s. They can cause short circuits in the home’s electrical system, and are notorious for invading air conditioning systems and electrical supplies indoors and out. In the public arena, they invade traffic signals, utility supply boxes, switching boxes, and other electrical and utility equipment, resulting in short circuits and damage to components. Ants are also a nuisance in home gardens and fields of vegetables, damaging crops and resulting in losses, especially during hot dry weather. The first step in determining the proper treatment for an ant problem is the proper identification of the species. It is difficult to eradicate fire ants, as they will continue to spread in satellite colonies from neighboring properties. Controlling them, however, is possible. Managing fire ants, typically requires repeated treatments. Your efforts will be more successful if you can recruit the neighbors to battle fire ants. Otherwise, re-infestation will be an ongoing battle. You probably read a lot about home remedies, but the fact is they either do not work or cause damage to the environment. While some home remedies may kill fire ants, they will not eliminate the colonies. Disturbing mounds will only cause the colonies to move. Shoveling ants from one mound on top of another does not force the colonies to kill each other, as some people believe. Sprinkling flour, grits or other solid food substances onto fire ant mounds is also ineffective against them. The only effective treatment’s are based on science. 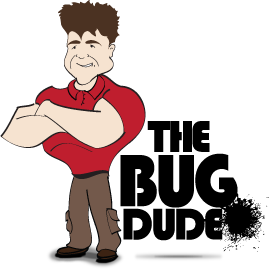 Contact the Bug Dude today to schedule professional pest control in Fort Worth, Texas. Fire ants are omnivores, which means they feed on both animal or vegetable sources. They will eat meat, greasy and sweet foods, other insects, earthworms, ticks, boll weevils, spiders, arthropod eggs, flea larvae, cockroach eggs, honeydew, and others. Plant sources include seeds, such as corn, sorghum, and soybeans. Plants sources include, corn, potatoes,peas,okra, and citrus fruit to name a few. Fire ants will also feed on young and newborn vertebrate animals, such as birds, rodents, and calves. In addition, fire ants consume carrion when the opportunity arises. Contact the Bug Dude today to schedule effective pest control in Fort Worth, Texas. While gasoline will kill some fire ant colonies, it is strongly discouraged. Gasoline is dangerous, costly, and will kill the surrounding grass and other plants. Furthermore, it will pollute the soil and potentially the ground water you drink, and nearby streams, lakes and rivers. In addition, pouring hot or boiling water on a mound kills only the ants it can reach, those close to the surface. However, it will also kill grass and plant life. Contact The Bug Dude for pest control in Fort Worth, Texas that will not harm your lawn. 1. Clean up food crumbs, and drink spills. Never leave left overs out in the open or throw them outside. Place in a trash bag and tie securing, placing it in the trash. Fire ants will invade your home for sweets such as donuts, sugary cereals, and other sweet treats as surely as if you sent them an invitation. Store non-perishable food in tightly sealed containers to protect against fire ants. In addition, store pet food in sealed containers, and do not leave pet food out at all times to avoid providing food to fire ants. 2. Fire ants enter a home through cracks and gaps, including around windows and doors, or in the siding, around gaps surrounding incoming wires, cables, pipes and plumbing. Seal these entry points with caulk or expanding foam, and contact The Bug Dude for pest control in Fort Worth, Texas. 3. Repair plumbing and roofing leaks, as fire ants are attracted to moisture, especially during a drought. 4. Check potted plants for fire ants in the soil before bringing them indoors. 5. Mulch is commonly used to assist outdoor plants in retaining moisture and deterring weeds. Unfortunately, it provides an ideal environment for fire ants. Our Though mulch is beneficial for plants, it provides a convenient environment for fire ants. Your pest control professional can advise you about alternatives for your area. 6. Maintain a space of at least 2-3 feet between your home and trees or shrubs to help prevent pests from entering. Contact The Bug Dude today to schedule professional pest control in Fort Worth, Texas for fire ant treatment. The Bug Dude can take care of your problem with fire ants or other pests with professional pest control in Fort Worth, Texas. We serve Fort Worth and the surrounding areas with professional pest control services you can rely on. Do not let pests ruin your outdoor activities and entertaining this summer, contact The Bug Dude today.